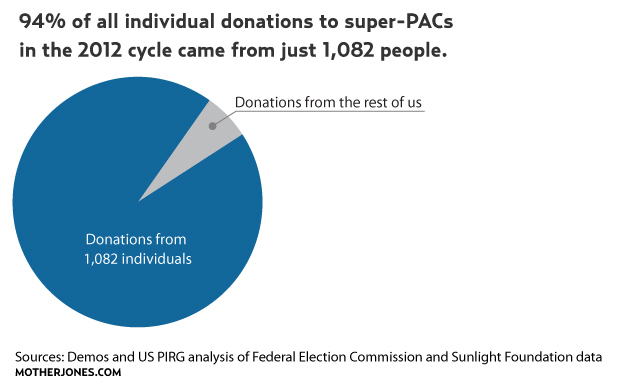 A mere 47 people are responsible for more than half of all super-PAC cash. Now a new report from the liberal think tank Demos and the nonpartisan US Public Interest Research Group has revealed how what has been called a “tsunami of slime” is funded by a tiny cadre of wealthy donors. Not exclusive enough for you? Then there’s the “Super-PAC Million-Dollar Club.” Forty-seven individuals have given $1 million or more to super-PACs in the 2012 cycle. That’s a group small enough to fit on a Greyhound bus (not that they’d consider coach), and they’ve ponied up well over half of the $230 million pocketed by super-PACs. 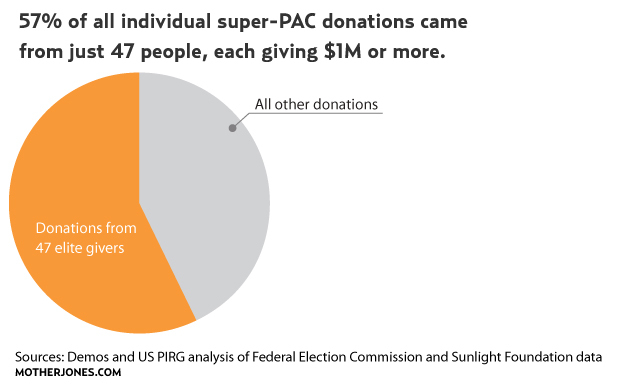 Super-PACs at least disclose their donors and their spending. On the other hand, dark-money nonprofits like Karl Rove’s Crossroads GPS, the Koch-funded Americans for Prosperity, and the pro-Obama Priorities USA don’t disclose any of their donors. Worse yet, as Mother Jones has reported, these nonprofits reveal very little about how much they spend. 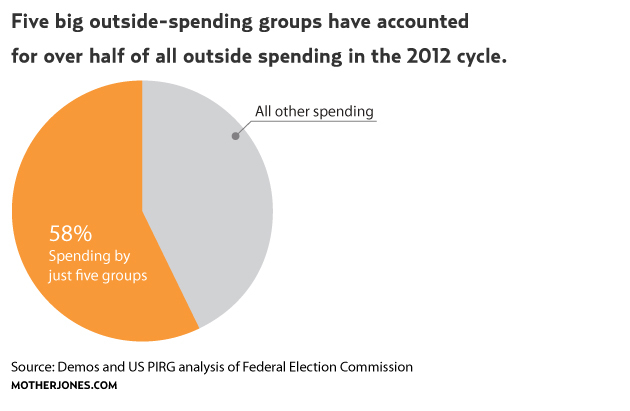 As of August 2, more than 700 super-PACs had reported spending money on elections. However, just five of those account for nearly two-thirds of the spending, with Republican-leaning groups, including the pro-Romney super-PAC Restore Our Future and Rove’s American Crossroads, leading the charge. The dominant presence among super-PAC donors is Las Vegas casino tycoon Sheldon Adelson and his wife, Miriam, who’ve given $36.3 million so far. That’s chump change for the Adelsons—in fact, $36.3 million is a mere 0.15 percent of their total wealth. 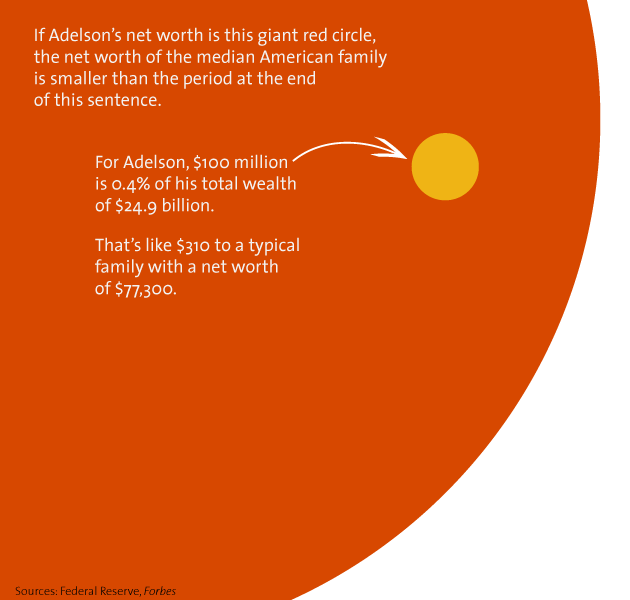 It would take 321,000 American families giving up 0.15 percent of their wealth to match the Adelsons’ super-PAC giving. 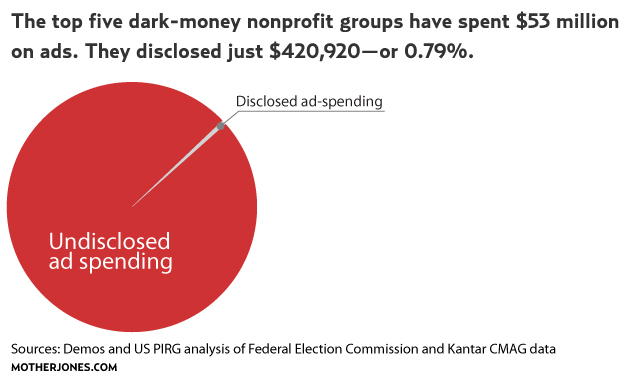 Correction: An earlier version of the above chart on ad-spending disclosure mislabeled the total percentage of ad spending disclosed by nonprofit groups. It is .79%, not .0079%.